Historians who study science and religion in the early modern period have rarely given sermons the attention they deserve. And since manuscript sermons are less accessible than their printed counterparts, references to these sources are particularly rare. Yet sermons represent an important point of contact between sacred and secular studies. Indeed, several of the preachers in the GEMMS database were closely connected to the world of science and had much to say about subjects that connected natural philosophy and theology. Sermons allowed these scholars to explore the theological implications of scientific and mathematical ideas, and to communicate their thoughts on these matters to an audience outside the republic of letters. Thus, by considering the sermons of scientifically-minded preachers in the GEMMS database, we can glean insights about how members of the public might have encountered ideas in mathematics and natural philosophy. As it happens, the GEMMS database includes three of the most significant English mathematicians of the seventeenth century. The first of these is Isaac Barrow (1630-1677), Lucasian Professor of Mathematics at Cambridge. Barrow went on to become Master of Trinity College in 1673, but not before recommending his friend Isaac Newton as his successor to the Lucasian chair. Among the highlights of Barrow’s mathematical career are his English edition of Euclid’s Elements (1656) and his set of Geometrical Lectures (1670) which included his novel method for finding the slopes of tangents. Today, Barrow is best known for his mathematics, but he was just as passionate about his work as a divine. Created D.D. in 1666 and made a royal chaplain to King Charles II in 1670, Barrow was a prolific preacher whose sermons have been published many times since his untimely death in 1677. So far, one full sermon by Barrow appears in the GEMMS database (BL Lansdowne MS 356, ff. 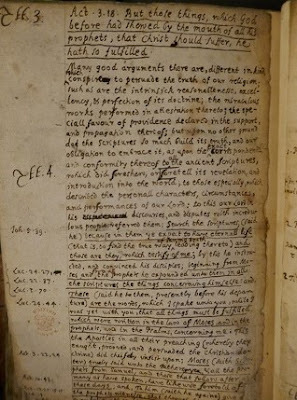 58v-69v; GEMMS-SERMON-008120) along with notes on three of his sermons taken by Joseph Keble (Bodleian MS. Rawl. E. 208, pp. 301-309, 474-480, 491-502; GEMMS-SERMON-000426). The second of these mathematician-preachers is John Wallis (1616-1703), Savilian Professor of Geometry at Oxford. He, too, is remembered for his impact on Newton’s career: the groundbreaking algebraic methods in Wallis’s Arithmetica infinitorum (1655) partly inspired Newton’s development of calculus. Like Barrow, Wallis is mainly known for his mathematics, but he also flourished as a theologian and preacher. He served as a scribe for the Westminster Assembly of Divines, was created D.D. in 1654, and published sermons and theological treatises throughout his career. Many of Wallis's manuscript sermons were unpublished during his lifetime, but they were published in a posthumous collection in 1791, including the only one currently in the GEMMS database (Bodleian MS. Add. D. 105, ff. 134r-144v; GEMMS-SERMON-000594). Finally, the database includes a volume of sermons by the London-based mathematician John Pell (1611-1685). Pell made his mark on the scholarly world by teaching mathematics on the Continent and by studying logarithms, a powerful new tool in seventeenth-century mathematics. But he published little on mathematics and even less on theology, and in both fields he has slipped into the historiographical background. Pell entered the clergy in the 1660s, but his sermons, unlike those of Barrow and Wallis, have never been published. The sermons in the GEMMS database (BL Add MS 4334; GEMMS-SERMON-000753) have rarely received scholarly attention. As these three prominent cases show, early modern men who were so inclined could pursue both a mathematical and an ecclesiastical career, either at the same time or successively. Furthermore, each of these mathematical divines studied natural philosophy and was admitted to the Royal Society—in fact, Wallis was among the founding members. It is perhaps inevitable that scholars like these, who had a passion for secular subjects as well as sacred ones, sometimes let their thoughts on science and mathematics slip into their sermons. Barrow, for instance, occasionally addressed secular subjects in his preaching. As Irène Simon has discussed, Barrow’s sermons are erudite but approachable, including classical references and everyday experiences in equal measure. Accordingly, he makes references to natural philosophy, but these are easy to follow. For instance, in his sermon on Proverbs 4:23 (“Keep thy heart with all diligence; for out of it are the issues of life” [KJV]), one of those attended by Keble, Barrow cites the opinion of “Aristotle himself … that the heart, that material part and principal entrail of our body, is the chief seat of the soul, and immediate instrument of its noblest operations” — a view that helps him to make sense of this passage on the importance of the heart. in that new, so different, state; where none of our languages are spoken; none of our experience will suit; where all things have quite another face, unknown, unthought of by us; where Aristotle and Varro shall appear mere idiots; Demosthenes and Cicero shall become very infants; where all our authors shall have no authority; where we must all go fresh to school again; must unlearn, perhaps, what in these misty regions we thought ourselves best to know, and begin to learn what we not once even dreamed of. Despite his passionate pursuit of mathematical knowledge, then, Barrow evidently felt that such earthly matters wouldn’t matter much in the end. Which yet the Wits of this Age, as they would be thought, (or the Fools rather,) would now cry-up as the more Rational [explanation for the world’s existence] (Without considering, If they must at lest allow Eternity to Matter; why not rather, to a Wise and Knowing Agent:) Only because their Wickedness, hath made them think it their Interest, That there be no God (to call them to account for it:) And therefore would fain perswade themselves, That there is none. And think there is nothing so Absurd, which they would not rather Beleeve, than That there is a God. For Wallis, it was excusable for the ancients Greeks to conclude that the world was eternal and uncreated since they had no knowledge of Scripture. However, since Christian society had been given God’s own account of Creation, modern-day Epicureans are fools who should know better. This magnetical attraction, that I spoke of just now, this motus sympathiæ, must be at a convenient distance: lay the iron and the loadstone close together; and you will see no motion, because they are already conjoined, and need it not. Again, lay it at too great a distance, and then it moves not neither, because not within reach of the magnet’s virtue. And so here, some there are at so great a distance from God, that for their parts they scarcely know whether there is a God or no, only as others, and things around them, tell them so; and then they take it upon trust; so that there is in these a distance too great to be drawn by this magnetic attractive virtue. On the other hand, the time will come, when those that now run after him shall attain to him; and instead of desiring him, shall embrace him (in fruition) and then the motion will be ended. Examples like these demonstrate two of the reasons why early modern preachers included natural philosophy in their sermons. Firstly, preachers used their platform to decry ideas about the natural world that they viewed as dangerous. Secondly, knowledge of nature could help to clarify theological ideas and make them relatable. However, preachers like Barrow and Wallis might not have been typical in this regard: these were scholars with particularly close ties to the world of science and mathematics. We would need a much longer study to determine how many preachers made connections like these between the sacred and the secular, and how often they did so. The GEMMS database would be an ideal starting point for such an in-depth study. In the first place, GEMMS can direct researchers toward sermons, like those of Pell, that have never been printed and have rarely been studied. In addition, GEMMS has many records of drafts and copies of sermons that would later be printed. By comparing different versions of a sermon, we might find that an author (or an editor) decided to trim or augment the scientific content for the published version. Finally, GEMMS can point readers toward sources like Keble’s notes that reflect how listeners responded to these ideas—including, for instance, whether they too were scandalized by Epicureanism, and whether they even paid attention to these parts of the sermon. In any case, sermons certainly warrant further study by scholars of science and religion in the early modern period. Mordechai Feingold, “Barrow, Isaac (1630–1677),” Oxford Dictionary of National Biography, Oxford: OUP, 2004. https://doi-org.libproxy.uregina.ca:8443/10.1093/ref:odnb/1541 (Accessed 16 Aug 2018). Domenico Bertoloni Meli, “Wallis, John (1616–1703),” Oxford Dictionary of National Biography, Oxford: OUP, 2004. https://doi-org.libproxy.uregina.ca:8443/10.1093/ref:odnb/28572 (Accessed 16 Aug 2018). Christoph J. Scriba, “Pell, John (1611–1685),” Oxford Dictionary of National Biography, Oxford: OUP, 2004. https://doi-org.libproxy.uregina.ca:8443/10.1093/ref:odnb/21802 (Accessed 16 Aug 2018); Mordechai Feingold, “Parallel Lives: The Mathematical Careers of John Pell and John Wallis,” The Huntington Library Quarterly 69 (2006): 451-468. Irène Simon,“The Preacher.” in Mordechai Feingold, ed. Before Newton: The Life and Times of Isaac Barrow (Cambridge: Cambridge University Press, 1990), 303-32. Alexander Napier, ed. The Theological Works of Isaac Barrow, 9 vols. (Cambridge: Cambridge University Press, 1859), III, 198. John Wallis, The Life of Faith. In Two Sermons to the University of Oxford, at St. Mary’s Church There; on the 6th. of January, 1683/4. and June the 29th. Following (London, 1684), 29. John Wallis, Sermons: Now First Printed from the Original Manuscripts of John Wallis, D. D., edited by W. Wallis (London, 1791), 92.